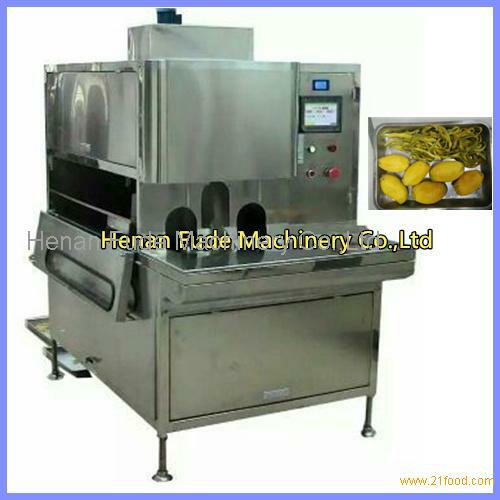 The mango peeling machine can peel mango about 1000pcs per hour, soft or hard, length or short, thick or thin, all ok. The machine has self-adaptive ability, can also peel orange, kiwi fruit, apple, lemon, guava, avocado, etc fruits, one machine can work all year. The mango peeling machine can peel mango about 500pcs per hour, soft or hard, length or short, thick or thin, all ok. The machine has self-adaptive ability, can also peel pineapple, grapefruit, jackfruit, taro, watermelon, cantaloupe, melon, pumpkin, etc.